The first option and best (if it works) is to have a conversation with your boss. 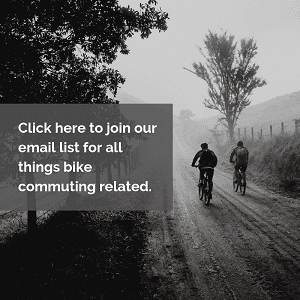 Let the boss know that you’re going to be commuting by bicycle. You can give her/him a few reasons why you’re making this change, and than ask if there is anywhere that you could safely store your bicycle. You would be surprised how many employers are not only ok, but extra accommodating to cyclists. Years ago I had one employer who allowed me to store my bicycle in a large storage closet that was rarely used. It was the perfect spot as it was out of the way. As a bonus it was inside so that it was safe from thieves and the elements. If you’re planning on commuting during the rainy/winter months we would recommend bringing a towel to wipe down your bike or at least to place under your bicycle so that it won’t make a puddle on your employer’s floor. Talking with your boss should be the first step towards finding a solution to storing your bike. Hopefully the boss will allow you to keep it somewhere inside rather than outside. If you have a suggestion such as an unused cubicle, closet, etc., perhaps it would be smart to mention the area you had in mind as well. I have cycling friends with offices large enough to store their bike in their personal office. Some of them have a wall that they lean their bike on, while others have a setup to place their bike on top of a shelf. There are a variety of storage tools (hooks, mounts, stands) you could use. 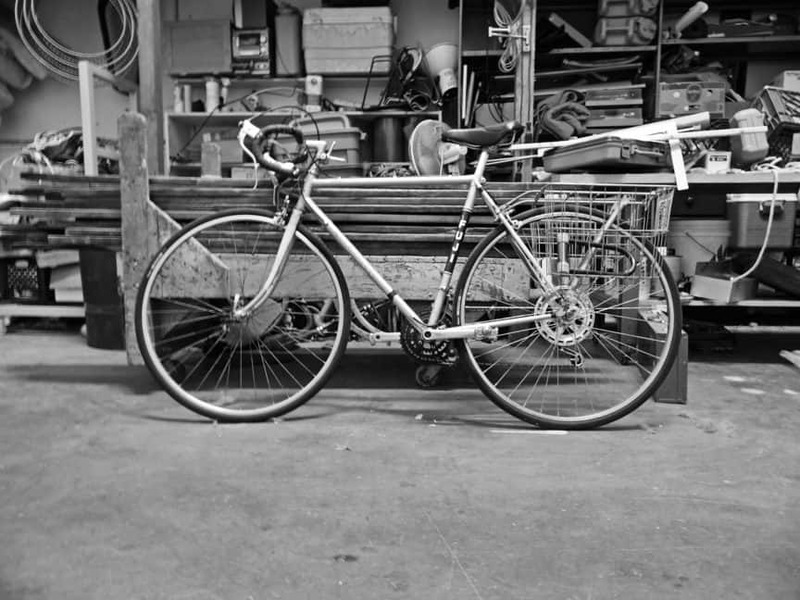 Do you have your own workspace that can accommodate your bicycle? Perhaps this could be your answer to storage. Many bike commuters have no choice but to lock their bicycle to a pole, sign, bike rack near their work. Honestly this isn’t the ideal, but for many it is the only option. My main concern with leaving a bike outside has been theft. 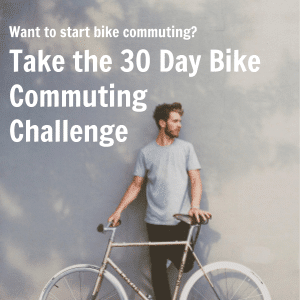 Depending on the environment around your work this may not be an issue, but for some it is a valid reason to not bike commute. For some the chance of theft is too high. In the past I had a job where there literally wasn’t any space for me to store my bike at work. The only option was to lock my bike outside on a rack. I purchased a regular bike lock from amazon, and chained my bike to the bike rack. I worked this job for a year, and fortunately the bike rack was in a highly populated area. Over the course of the year no one stole my bicycle, but I did have a bike light removed and stolen from it. I don’t share this to scare you away from bike commuting, but as a reminder that there are thieves out there. A few tips to preventing thieves from stealing your bike. 1) Make sure you don’t leave your bike outside overnight. The cover of night can help robbers commit the crime unseen. 2) The more bike locks the more difficult it will be for your bike to be stolen. 3) Lock your bike in a well lit and area with other people. A side alley outside of the view of the general public isn’t a great spot to keep your bike. One final tip on storing your bike outside is to keep a plastic bag with you on the rainy, wet days. You’ll want to use the plastic bag over your bike seat to keep it dry so that when you’re ready to get back on your bike you don’t need to sit on a wet seat. Does your work have a parking garage? If so, this could be the place for you to keep your bike. Depending on the garage it may either have security or cameras so that you won’t have to worry about your bike being stolen. In addition, a parking garage will have a roof to keep your bike away from any rain storms. Our recommendation is to still lock up your bike if its in a parking garage as you never can be too safe. 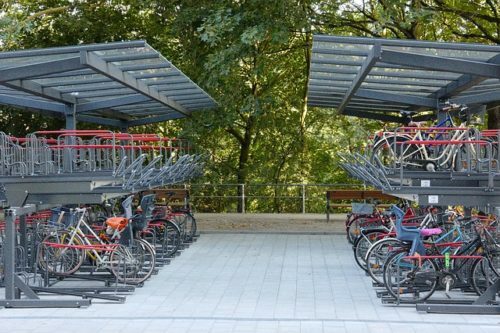 This isn’t everywhere, but some cities are creating bike parking near subways and other public transportation. You can rent a space to hold your bicycle in safe storage and take the local bus or subway the rest of your way to work. Check around your city as you may have a bike storage parking that you weren’t aware of. If there is a local bike shop close to work you can talk with them about allowing you to store your bike there during the day. 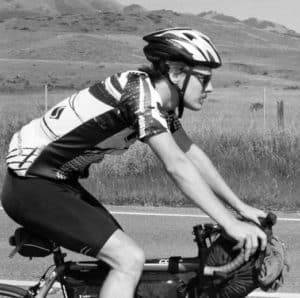 Bike shops are becoming more and more rare these days as online retail stores take over. If they’re letting you store your steed at their store you can make sure to pay it forward by going to them for all your bike repairs and purchases. It’s not always easy to figure out how to store your bike at work, but we hope that these ideas will help you figure it out. Bike commuting is a great way to get ready for a day at work and wind down after. If you’ve ever had the opportunity to commute by bike you know that there are many benefits to this kind of transportation. It would be a shame to be unable to be a bike commuter, because you couldn’t figure out a way to store your bike. This is only a list of options, and we know that every job is different. Maybe a few of these will work out for you at one job, but none at another. We hope we were able to help you solve this problem, but if not, at least got you thinking creatively at overcoming this hurdle. Find a spot to safely store your bike at work, and start riding!